Why is Japanese Food so Good For Us? Did you know that Japanese people have the longest life expectancy of any country? Although much of this can be attributed to genetics and universal health insurance, it is clear that their healthy diet is also a major factor. Traditional Japanese food is well balanced and rich in seafood, seaweeds and health boosting vitamins and minerals. A typical meal in Japan consists of a bowl of rice, grilled fish such as mackerel, some Japanese style pickles and miso soup on the side. This combination of food is not only tasty, but provide all the nutritional benefits that the body needs. Carbohydrates in the rice, omega-3 essential fatty acids in the mackerel, pickles as part of your 5-a-day and miso for our digestive systems. With just a few simple dishes, you can get all the amazing health benefits of Japanese cuisine! Eat well and maybe you too can live to be as old as Jiroemon Kimura, the oldest gentleman in the world who is currently a youthful 114 years old! Sushi is a classic Japanese dish and the first thing that comes to mind when we think about Japanese cuisine. Made with sticky, short grain rice that is mixed with a light rice vinegar and combined with fresh fish or vegetables, sushi is a seriously healthy option and you can buy everything you need from Japan Centre. 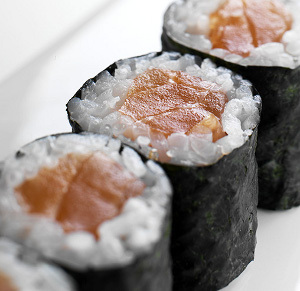 There are many different types of food that fall under the title of sushi. Sushi actually just means ‘sour rice’ in Japanese due to the traditional custom of fermenting fish using rice in the days before refrigerators. Therefore, not all sushi is made from raw fish, but can be made with cooked fish, various types of cooked seafood such as prawns or shellfish, or vegetables. A combination of fresh fish and vegetables makes a tasty and healthy meal that is also great fun to make at home. If you have some turkey leftover from Christmas, why not try making turkey sushi rolls? Sushi Recipes online at Japan Centre. Marmite, blue cheese and even coriander divide the best of us into either true fans or bitter enemies. Natto is another one of those foods that some people can’t stand, where as others find the texture heavenly, the aroma enticing and the taste to die for! More than just mouldy beans, natto are made from carefully selected soy beans that are naturally fermented to release the powerful, intoxicating flavour and wonderful health benefits. Try not to be put off by the slightly slippery texture and unfamiliar smell, did you know that natto are claimed to help prevent heart diseases and cancer, lower cholesterol and even help you loose weight! To eat natto, add the included sachets of mustard and soy sauce and mix them up well until the natto becomes stringy. Pour them over rice and enjoy as a healthy, traditional breakfast. Japanese people are always impressed when ‘Gaijin’ eat natto, so enjoy them with an open mind, but maybe a held nose! Buy natto online at Japan Centre and check out our natto recipe too. PS: Scroll down to the comments to read about my first experience with the infamous natto! 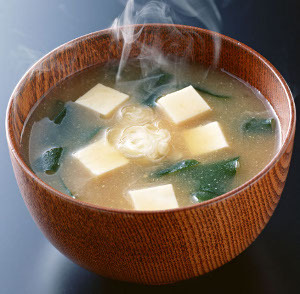 Miso soup is a delicious and healthy side dish which is traditionally served with all Japanese meals. Miso paste, made from fermented soy beans, rice and barley is mixed with dash soup stock infused water and then seasoned with sliced tofu and spring onions. Quick and easy to prepare, full of healthy vitamins and minerals and seriously tasty, no wonder miso soup is one of the best kept secrets of the health world! Miso paste also makes a fantastic marinade for meat and fish dishes to add a rich, homecooked style flavour to any meal. Try marinading salmon or tuna steaks in a miso marinade before grilling them for a double helping of health foods. Tofu has a bit of a bad reputation in the West as simply being a meat substitute. However, in East Asia where it was developed, tofu is appreciated for its light and delicate taste, as well as being a super health food. 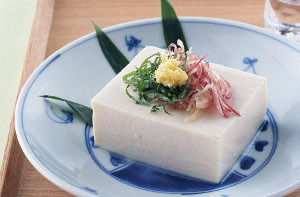 There are a few ways to enjoy tofu, our favourite at Japan Centre is a simple dish called Hiyayakko, where a chilled block of tofu is served with a dash of soy sauce and a simple garnish of grated ginger and sliced spring onions. Of course, if you want to use tofu as a healthy meat substitute, there are plenty of options for that too. We recently made a tofu burger which was deliciously juicy and tasted great even for the die-hard carnivores! Green tea has become more and more popular over the last few years as people are seeing the great health benefits of it. Green tea contains an antioxidant called catechin which can help to do everything from reducing heart disease to calming you after a stressful day. With so many benefits, and a great taste, green tea is one of the best things you can incorporate into your new diet for 2012. Many people are initially put off by green tea if they have not drunk it correctly prepared. As green tea is fresher than black tea, it only needs to be brewed for a short amount of time, otherwise the taste can become too bitter. Unlike normal English tea, green tea leaves needs to be brewed with water that isn’t boiling too. Brewing for approximately 1 minute with water at 80°C will give you a much better tasting green tea. Make sure to read about the brewing instructions for different tea grades, as high quality tea such as gyokuro is typically brewed at lower temperatures of around 60°C. Matcha is one of the hot new keywords floating in the green tea world these days. It is a type of green tea where the leaves are ground into a very fine powder which is then mixed with water. With matcha, you actually consume the whole tea leaf rather than just infusing it with water which makes it even more healthy… and delicious. 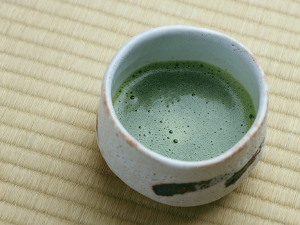 It is commonly mixed with a special matcha whisk to create the slightly frothy, inviting beverage shown in the image above. Powdered green tea such as matcha is also used as a flavouring in Japanese foods for cakes and other desserts. This is a great way to give some extra taste and health benefits to any treats! Check out these great green tea recipes from Japan Centre below. Posted in Food, Recipes and tagged Diet, Health, Miso Soup, natto, sushi, tofu. Bookmark the permalink. On my way to JC to pic up some healthy foods! Here is my first experience with natto in Japan! I remember it taking me a few months to build up the courage to try natto! Ever since I had arrived in Japan a few months earlier, numerous inquisitive Japanese people had enquired if I liked them. 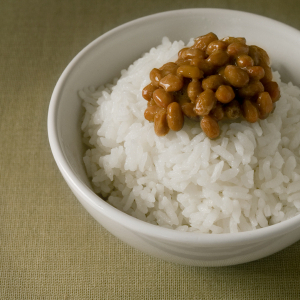 What was this mysterious ‘natto’, and why was everyone always making such a big deal about it? I first saw, or should I say smelled, them when a Japanese friend was preparing breakfast. An intense, powerful aroma invaded my nostrils as he offered “Want to try?”. I was still recovering from a previous experience with ikura salmon roe so decided to declined his offer at the time, but I knew I had to try them soon. That time came a few months later when I threw away my preconceptions, took a deep breath and bought some natto from the local supermarket. After pouring them over rice in the traditional way, I took my first bite and was pleasantly surprised! Natto certainly have an acquired taste, but you should definitely try at least once as you may learn to love them like me! Interesting page. One thing though, you should not have a piece about “green tea” and not qualify that there is a difference between leaf green tea and macha green tea which is pictured. It would be kinder to say that the macha powdered tea is whisked before drinking. Leaf green tea is certainly better with the water off the boil and with a good shaded leaf tea the temperature is better at 60˚C. Here is wishing you all a very happy, healthy and peaceful new year. Thanks Bill, you are absolutely right! I have made a few modifications to the article which hopefully makes it a little clearer! Glad to hear you are a fan of green tea. It was only after spending time in Japan where I was able to taste a perfectly brewed cup that I began to enjoy it. I think some of the instant tea bags I had tried in the UK before had put me off somewhat due to the bitterness which comes from over brewing. One of my resolutions for 2012 is to eat healthier; and I guess doing it through Japanese cuisine is an even better resolution.